Stepping Into The Light helps you open to your own unique abilities so you can begin receiving loving and supportive messages from your loved ones, angels and guides. Julia talks about just some of the ways Jesus can give you winks that he is near. Since Julia began calling on The Rainbow Crew to help her and to guide her as to what she can do for them, Jesus has been sending even more winks. We're all going through ascension "stuff," getting ready for this bless-ed shift. Julia has found calling on Jesus and The Rainbow Crew to be oh so comforting. Healing With The Saints & Angels Plus Level Reiki I & II Celebrating Luca Special! Healing With The Saints & Angels, Reiki I & II, Plus Master / Master Teacher Celebrating Luca Special! Come and spend a magical week with Julia in Sedona! She will be celebrating her birthday at one of her favorite places ever! P.S. Stay tuned for the launch of The Rainbow Crew on Patreon! You won't want to miss it! Julia announces the birth of her newest grandson, Luca! He is one of The Rainbow Crew and is just one of the special munchkins guiding Julia on her path. Listen to what happened to Luca at birth and why Julia felt called to launch one of her most popular courses, Healing With The Saints & Angels Plus Reiki I & II Attunements. It's time for all healers to step up, to embrace their calling, and to share their badass healing mojo with the world. Julia can show you how! Here are the price points Julia brings up in this podcast. Be sure to get in on the Early Bird pricing!! The divine light in ME sees the divine light in YOU! Are You Part Of The Rainbow Crew? Julia talks about what the term "The Rainbow Crew" really means. After a conversation while at Angel Valley during her last retreat, Julia realized there may be some confusion as to who she considers part of this magical bunch. Perhaps YOU are a part of The Rainbow Crew! Spiritual Bootcamp is just $47 right now! If you're ready to begin creating a life you love you won't want to wait another minute. Julia talks about a very surprising visit she had by Archangel Michael and two "new" friends. With the ascension process in full swing many are experiencing magical shifts (some not so comfortable at times). But what has also increased is the number of visits from beings who are new to our spiritual team. Listen to Julia's story about who showed up for her while she was preparing for her most recent retreat in Sedona, Arizona. You won't want to miss this one!! Julia talks about how often she calls on the angels. They literally can help with everything! Julia gives some recent examples of how the angels came when she called on them to help illuminate her path. So much ahhh-mazing can happen, on a regular basis, when we call on the angels for help. Please give Julia some stars and be sure to rate & review her podcast so that others will check it out! Tap Into Your Creative Side and Turn Up The Flow! Enjoy a replay of our most popular episode while Julia leads her retreat in Sedona, Arizona. Julia shares the importance of doing something creative on a regular basis. When we tap into our creativity it just turns up the flow in our lives. The universe is bountiful and plentiful and wants to send us everything we have ever dreamed of, and more. Tapping into our creative side helps to open the floodgates so that it may all come flowing in quickly, easily and effortlessly. Julia talks about something that helped her heal from Lyme Disease. She also shares a message she received from God about the ascension symptoms we are currently experiencing, and what we can do to move through them with more grace and ease. As we shift we are becoming more sensitive, but isn't a bad thing. There are measures we can take to exist in this world and all of the technology around us. Take a listen to Julia as she shares what might be exactly what you need to take your body back. Here's the link to q-link in case you want to learn more and check out their products. The light in me sees the light in you... And it is divine! Join Psychic Medium, Angel Intuitive and Author, Julia Treat for the Stepping Into The Light Podcast. Develop your own intuitive mojo and hitch a ride with the Divine to connect with your own divine light. Create a blueprint for manifesting magnificence and blast thru blocks to create anything you desire. In this episode Julia talks about becoming the light, and all that comes with our massive shift. Listen to Julia as she shows you the way to Becoming the light for all. Check out Julia's Spiritual Bootcamp! It is running every single day so don't wait to sign up and start manifesting a life you love! It's only $47!! To check out all of the juicy details of Julia's upcoming Sedona retreat, click here! Julia's 6-month Coaching Program, Prosperity Queens & Kings is launching this week! If you're a spiritual entrepreneur and you're ready to go BIG this one's for you. Listen to all of the details then click the link below! It's time to create a massively prosperous business and I'm ready to show you the way. My team and I have made this so easy for you. It's time to create EPIC!!! Come and listen to Julia on Hay House Radio! She needs your love and support. 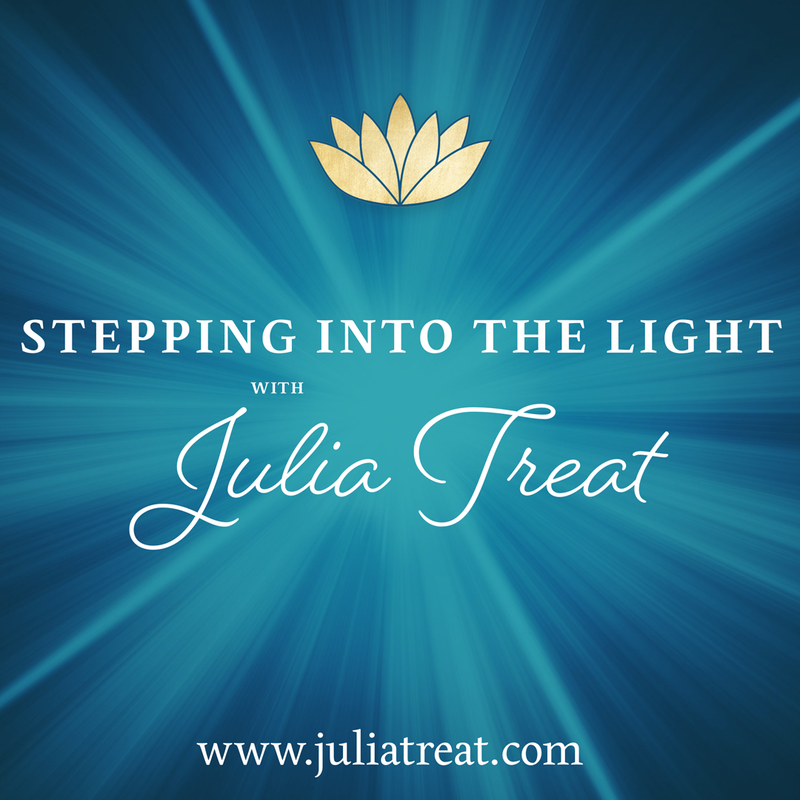 Julia has always dreamed of being a Hay House author, and although that hasn't happened (yet) she will be on one of their most popular radio programs, Bright New Voices, talking about her book, Stepping Into The Light. Come and listen as Julia shares her story with the world. And please share the link so that others will tune in. The light in me see the light in you... and it is divine! Copyright 2015-2019 Julia Treat. All Rights Reserved.